Back in September of 2000, I had just finished pouring an entirely unreasonable amount of money into the worst car I had ever owned, a 1994 Mercury Sable. Despite feeding it a steady diet of Benjamins, the car refused to run stably and constantly broke down. After a new engine, a transmission rebuild, and countless small repairs, the final breakdown was the final straw. The real stinger is that I had bought it to replace a 1993 Saturn SL2 that had been stolen from in front of my apartment. That car was one of the best I had owned I even get Ottawa Tinting Zone to tint their windows so it will look better, which lead me to go Saturn one more time. I didn’t go used. I’d been burned on used cars a bit too much by that point. No, I went new. 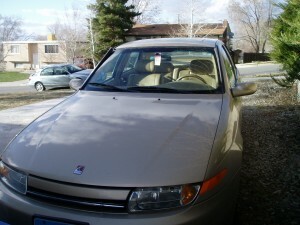 I’d been drooling over the new L-series that Saturn cooked up, the first one with a V6 engine. It’s been serving me well for 8.5 years, 129,616 miles, and an ambitious move to Utah with a fully-loaded 5’x8′ trailer. Now it’s going to belong to someone else. Shauna and I went down to a car dealership on Saturday to shop for a new vehicle. Being a two sedan family worked out really well when it was just us and the dogs, but a carseat throws a big monkeywrench into the mix. Shauna’s car was too small to accomodate the rear-facing seat and comfortably seat someone in the passenger seat. We also realized that during our road trips, it would be very tough to fit us, Liam, the dogs, and luggage into either of our cars. (The last trip had us stuffed to the gills and we didn’t even have Liam then.) It was time to upgrade to an SUV. 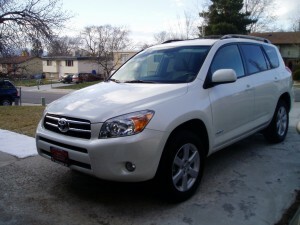 We ended up walking away with a 2007 Toyota RAV4. As part of the purchase, we traded in my old L-series. We figured that Shauna’s car was newer, had 40,000 fewer miles on it, and got better fuel economy. Since I’m going to be doing the bulk of the driving these days (Shauna will be telecommuting when she starts working again in April), that works out really well. All the same, I’m going to miss my car. It’s really powerful (0-60 in 5.9s), very comfortable, and I’ve had a lot of memories in it. During the first three and a half years that I owned the car, I drove for a living doing on-site computer repair. I spent the better part of 20-25 hours a week in it going all over Las Vegas. Then it served me well on a move to Utah and driving around in snow, something I was never used to. I built a lot of memories driving that car around in two different states for a significant chunk of my life. It’ll be weird to switch cars and kind of sad to let the old one go. Here’s to good cars. That should be pretty easy now since GM has decided to kill off the brand. Your feelings toward Saturns are my feelings towards Toyota. Last year when I got rid of my Tacoma after 9 years, it seemed like I was getting rid of a family pet. Fortunately, we’ve stayed in the Toyota family with our Yaris, and we love it too. I don’t know that I’ll ever drive another brand name car. actually Pontiac will stay around as a specialty market brand. Hummer and Saab will be gone immediately (although I think someone will resurrect Saab) Since GM is talking about also getting rid of Opel it would make sense for them to package Saturn with it or at the very least bring under the Chevrolet umbrella. I am glad that the Chinese like Buicks as that is the only reason that brand will survive. I have loved all my Buicks and the Chinese have made it the #1 selling car in their country. I have had nothing but GM, Chrysler& Ford my whole life with a couple of Leyland Toys thrown in for good measure. GM actually makes a good product at this point but I am sure you will be very happy with your Rav 4. Being a post war baby my Dad drilled into me not to buy Japanese and while I was in the Midwest in the early 70’s some dealers would not allow an import to be parked on their lot. The funny thing about my twisted mores is that I was a very successful Toyota car salesman in the early 70’s but wouldn’t own one. I remember when Toyota 1st came to the U.S. it was called a Toyopet. It wasn’t successful and so it was pulled back and they left the country for a while. A few years later they made another run at the U.S. with a model called the Crown. It did very well so they added the Celica , Corolla, Corona, and Land Cruiser to start to become a force in the industry I have now been a part of for 39 years.